You may recall that almost exactly a year ago, Shiite truck drivers in Anbar province were stopped by ISIS patrols, questioned as to the exact form of Islamic prayer, and executed when they didn’t give an approved Sunni response. The event was captured on video, and visiting it today I was struck by the reference to Dabiq — see screencap above — already a crucial reference for pre-caliphal ISIS. The gentlemen in the upper image, above, are acting. Those in the lower image died in late August 2013. The original video can be found here for comparison. 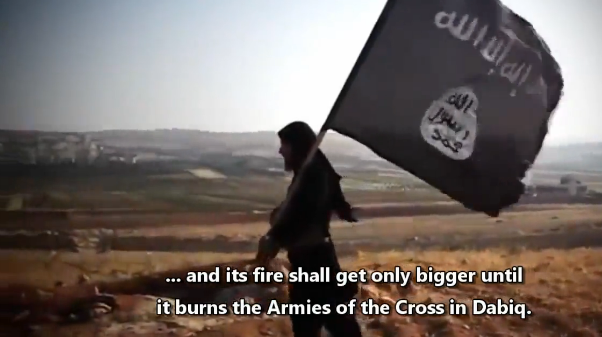 The video ends with a statement threatening the “Armies of the Cross in Dabiq” to be burnt by the fire whose spark was ignited in Iraq. Dabiq is a town near Aleppo where the battle of Marj Dabiq took place on August 24, 1516, and it ended up in a decisive victory of the Ottoman Empire over the Mamluk Sultanate. As readers of Furnish, Filiu or myself will know, the Dabiq battle mentioned in the video references a future, specifically end times battle — a far more significant matter.